Help us stop UK wildlife getting into a tangle by tying a knot in any netting that you are throwing away. Netting is often blown out of our rubbish bins by the wind or carried away by animals, and it ends up on our streets, in our gardens or littered in the countryside. This discarded netting then becomes a serious hazard for numerous animals including birds, snakes, deer, badgers and foxes who become tangled, causing serious injuries, open wounds, or even suffocation or starvation. Loose netting which is not maintained can also trap animals. Netting that we use regularly, such as garden netting, tennis court netting and bird deterrent netting can trap wildlife if it becomes loose and unsecure, and cause similar injuries to discarded netting. 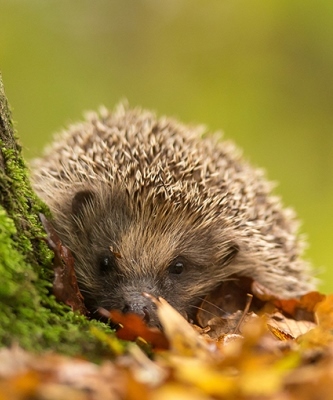 Hedgehog populations in the UK have dropped by 95% in the last 50 years. This decline is due to numerous interlinking factors including habitat loss, food reduction, traffic incidents, and smaller hazards such as litter and slug pellet poisoning. Discarded or loose netting is especially an issue for hedgehogs as they can easily become tangled in it due to their spikes. Once caught in netting, hedgehogs find it difficult to untangle themselves and they can suffer ligature wounds, open wounds or even death by starvation. Discarded netting is not the only litter which harms wildlife in the UK but in fact all forms of litter are a threat. Animals can become trapped in used food cans, tangled up in discarded elastic bands or cut themselves on broken glass. • Secure and maintain netting which is in use. • Wash and squash any used food cans or food containers before recycling them. • Reuse elastic bands or cut them in half before throwing them away. • Cut the loops of plastic can holders before disposing of them. • Clean glass bottles or jars before recycling them. • Cut up rope, fishing line or similar items into small pieces before putting them in the bin. • Do not release Chinese lanterns or balloons.